Lucifer deals with the fallout of the previous episode and explores the implications of Cain now being mortal and how that relates to his relationship with Chloe. Last week ended with the reveal that the Mark of Cain was now gone suggesting that the removal is tied to Chloe in some way. My theory is that Cain’s showing of remorse was the trigger for removing the curse but this episode goes down the route of Chloe’s love being the thing that causes it. This appears to be confirmed when Lucifer realises that being mortal around Chloe means that she must love him. This actually makes some degree of sense as Lucifer was shot in the very first episode but wasn’t injured so that particular continuity issue has been addressed by this but this doesn’t make it good. The problem I have with this is that it further turns Chloe into an object of affection and a trophy to be won by either Lucifer of Cain. Chloe is a better character than that and deserves better than to lose some of her agency because two men are vying for her affections. Not only that but it establishes Chloe as someone who falls in love very easily if she fell for Lucifer mere weeks after meeting him and did the same with Cain while still harbouring those feelings for Lucifer. It’s all too messy and doesn’t paint Chloe in a good light. This also muddies the waters when it comes to the notion of God putting Chloe in Lucifer’s path. It seems clear enough that this is something that happened but it’s unclear why that is. The writers have used this fact as the justification of why Lucifer doesn’t pursue a relationship with Chloe. God putting her in his path has made him question whether his or her feelings are real and he refuses to play into his father’s hands. Of course all of this can be hand waved by the “God works in mysterious ways” explanation which this show seems to make liberal use of. At some point answers have to be delivered though. If Lucifer and Cain’s vulnerability are proof of Chloe’s love for them then Lucifer has no real reason to shy away from pursuing a relationship with her any more. This season has largely been about him keeping a respectful distance from her while still keeping her in his life. It has been a frustrating plot point in some ways but hasn’t stopped the show from being boundlessly entertaining thanks to the strengths exhibited in other areas. This episode has Lucifer acknowledge that Chloe might be in love with him and consider acting on it but only as a way to keep Cain away from her. He showers her with gifts and affection in a typically over the top fashion in order to protect her from Cain’s attempts to win her back after breaking her heart last week. Chloe doesn’t accept Lucifer’s attempts because she sees this as yet another example of him playing with her emotions only to pull away when there’s a possibility they will get too close. It’s good that Chloe recognises the tropes the show chooses to continually employ and passes them off as character flaws. It’s at least some attempt to address the fact that the will they/won’t they plot is being artificially drawn out. Lauren German’s acting in the scene where Lucifer tries to impress her with a lavish dinner to prove that having him in her life is better than having Cain is really impressive. At this point he isn’t vying for her affections because his main aim is to get Cain out of the picture as he feels that Cain is dangerous. Chloe is taken aback by this showing of affection being motivated by Lucifer wanting to show Cain up. Lucifer tells her that Cain doesn’t deserve her but she challenges that by questioning who does deserve her and he doesn’t have an answer for her because he is unwilling to admit his feelings for at that point. She tells him that he can’t have it both ways indicating that he has to make a decision and that she is tired of him giving her the runaround. She sees it as an issue of jealousy because it looks like Lucifer doesn’t want her but doesn’t want anyone else to have her which tracks with the overall selfish perception others have of him. It could be said that Cain is on his way to being redeemed as of this episode though I wouldn’t necessarily agree with that. My thinking is that it’s more of an epiphany he has when he realises that hurting Chloe is the opposite of what he wants. I don’t feel that redemption is a possibility for Cain because he still exhibits all the signs of being a selfish man fixated on a singular goal. In this case his goal has moved from securing his own death to winning back Chloe but it’s still selfish and he only seems to want it because of what he can personally gain from it. He makes mention of the possibility of growing old with Chloe and living a semblance of a normal life. Why he thinks that Chloe is the one he could and should do that with is also a selfish thought because he seems to be exploiting Chloe’s feelings for him rather than having any genuine feelings for her. The end of the episode was something I found really baffling. Just last week Chloe was struggling with the notion of telling Trixie that Cain was her boyfriend and this episode ends with her accepting a marriage proposal from him. The show may have skipped over much of the formative stages of their relationship but the suddenness of all of this is staggering to behold. This is especially true when Chloe has always been characterised as being overly cautious and very guarded when it comes to expressing her feelings. It took her long enough to admit that there was something between her and Cain and even longer to settle into a relationship with him so accepting his proposal so soon after he hurt her and made her doubt his feelings for her feels insanely out of character. It’s possible that she will regret this next week and come to her senses but that wouldn’t excuse the fact that she considered accepting it in the first place. Chloe just isn’t that sort of character and it’s ludicrous to present this scenario as something Chloe would go through with. 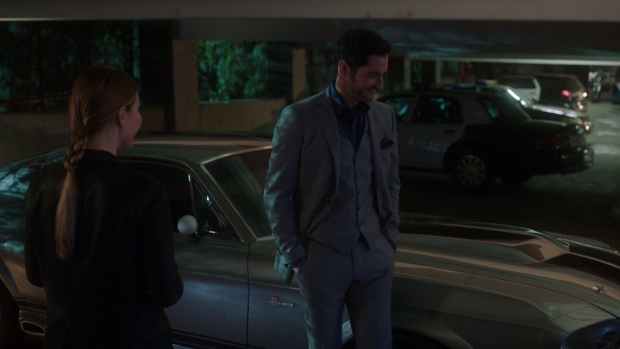 To make matters worse this comes at the point where Lucifer is waiting just outside ready to confess his undying love for Chloe after an excellent conversation with Linda where she comes to him as a friend rather than a therapist. The distinction is important because Linda is able to supply very different advice as a friend and encourage Lucifer to go after the thing he wants but has been denying himself. She directly questions him on his decision to not let Chloe in on who he truly is or admit his feelings to her and calls him out on taking the choice away from her because she doesn’t have all the facts she needs to make an informed choice. Lucifer finally admits that he wants Chloe to choose him before going after her. The complication to this is Cain has beat him to it and has already proposed therefore dragging out this love triangle for longer. It’s very strange how swiftly this turned around from being interesting to tedious but apparently all it takes is a single episode where characters make wrong headed decisions inconsistent with their established traits. It’s nearly impossible for me to invest in what the characters are doing when none of it feels earned and it’s even more frustrating that this sort of plot driven development that ignores the characters is something that Lucifer usually skilfully avoids. Maze in her brief appearance manages to thankfully be a lot more consistent. The discussion of the plan to kill Cain and frame Lucifer for the murder is consistent with her behaviour in the previous episodes but there is also the faintest glimmer of humanity in her staged reconciliation with Chloe. She is essentially only there so that Chloe will open up to her about how she feels but the conversation does force her to confront some unavoidable truths. Maze firmly believes that people will always let others down in some ways and that’s something she struggles with as she doesn’t know what it means to forgive or what it takes to genuinely forgive someone. This offers some explanation for her self destructive behaviour and serves as a reminder of her Demonic roots. She is incapable of forgiveness because she doesn’t really know what it is. Her experience of dealing with those that wrong others is to torture them for eternity so she has no analogue for dealing with it as a mature adult would. There is a further hint of humanity when she realises that Trixie is mad at her and clearly feels genuinely guilty about that. Charlotte is brought into the overall problem by Amenadiel because he still believes that Lucifer is a test from his father. He asks her to find proof that Cain is an evil man so that he will be out of the way and Chloe will choose Lucifer instead. Amenadiel was looking for legal assistance from Charlotte but she’s currently too far gone to care about the law and decides to do things like break into Cain’s home and follow him around. Both of these get her nowhere but serve as a fun diversion from the main thrust of the plot while developing Charlotte’s current struggle. She is convinced that helping Amenadiel will put her in God’s good graces so she approaches it like it’s a mission from God. Charlotte is the right amount of unhinged in this episode and her misguided belief that she will be able to prove herself a good person with a couple of grand gesture good deeds is appropriately hilarious. The case of the week is somewhat forgettable though does tie in nicely to the main plot of two men vying for the attention of one woman. 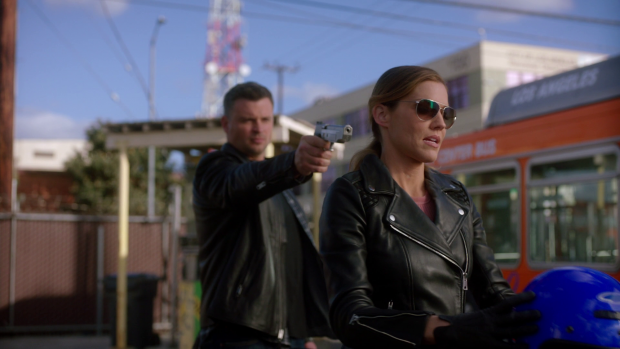 In many ways it’s a more extreme example of what Lucifer, Chloe and Cain are experiencing and the episode does a good job of not making it too ridiculous other than a fake prosthetic leg to give it something a little ludicrous. For the most part it’s designed to prove the point that the episode is trying to make and it certainly does that even if I don’t agree with what that point is. A messy episode that suffers from significant problems in the way it treats Chloe. She is characterised as someone who falls in love far too easily as the episode wants the viewer to believe that she fell in love with Lucifer after only a few weeks of meeting him and has apparently done the same with Cain. She also loses a lot of her agency as she is framed as a trophy to be won by one of the immortals vying for her affections. It’s clumsily handled and Chloe’s character definitely deserves better. Her acceptance of Cain’s proposal is badly out of character and Lucifer’s realisation that he wants Chloe to choose being with him is yet another example of artificially lengthening the love triangle. Maze is thankfully handled with a lot more consistency. The suggestion that she is incapable of forgiveness because she doesn’t understand it is really strong and the way she fakes trying to renew her friendship with Chloe works really well as it forces her to confront some uncomfortable truths. The idea that Trixie is mad at her makes her feel guilty suggesting there is some semblance of Humanity within her. Charlotte agreeing to help Amenadiel prove that Cain is a bad man to remove him from Chloe’s consideration is really amusing and does a great job furthering Charlotte’s arc. Her belief that she’s on a mission from God fits her current mindset and her actions are very amusing. 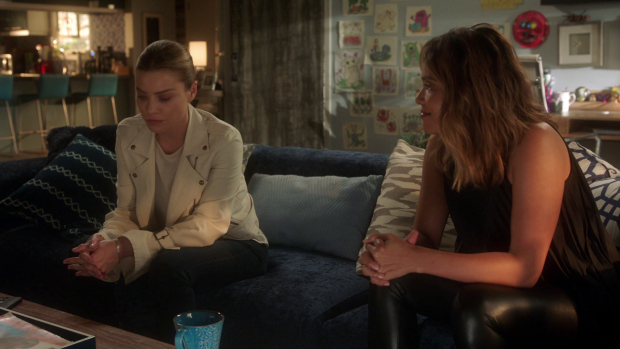 The case of the week is played as seriously as it can be in order to hold a mirror up to the Chloe/Lucifer/Cain situation and it does so well enough even though I don’t agree with the message that is coming across.